Red Blood Cells: Red Blood Cells contain haemoglobin which combines with oxygen which forms to be oxy-haemoglobin. This is is the form where oxygen is transported around the body. The blood of a male has 10% more red blood cells the females. Red blood cells are made of the molecules; Glycophorin, Activin, ADAM protein aswell as various types of ADAM Enzymes, Neutorophils, Eosinophils, Glycoprotein of Basophils, Protease Enzymes, Glycoprotein of Lymphocytes, B cells in Lymphocytes, Monocytes, Macrophages and Eosinophils. White Blood Cells: White Blood Cells main job is to combat infection. They move out of the blood stream through connective and epithelial tissues. White blood cells ingest bacteria and foreign material. White blood cells are made of the molecules; Immunoglobulins, Hemoglobin and various ADAM Enzymes. Platelets: Platelets are fragments of larger cells. They clot blood when damage occurs to blood vessels. Patelets are made of the molecules; Erythropoietin, Interleukin 11, Fibrin, Platelet factor 4 and Apolipoprotein H.
The heart is the organ that supplies blood and oxygen to all parts of the body. It is about the size of a clenched fist. The heart is located in the chest cavity between the lungs. The heart is surrounded by a fluid filled sac called the pericardium. Blood is pumped away from the heart through arteries and returns to the heart through veins. The major artery of the body is the aorta and the major veins of the body are the vena cava. The heart is composed of cardiac muscle which enable the heart to contract and allow the synchronization of the heart beat. The heart wall is divided into three layers: the epicardium, myocardium, and endocardium. The epicardium is the outer protective layer of the heart. The myocardium is the muscular middle wall in the heart. The endocardium is the inner layer of the heart lined of blood vessels. The heart is divided into two halves and the halves are divided into chambers. The upper two chambers of the heart are called atria (atrium) and the lower two chambers are called ventricles. The atria receive blood returning to the heart from the body. The ventricles pump blood from the heart to the body. Valves allow blood to flow in one direction between the chambers of the heart and prevent back flow. Arteries: Arteries are thick-walled vessels that carry blood away from the heart. They have thick walls so they are able to withstand pressure of pumping blood but this also means that arteries don't allow the movement of materials and gases between blood and tissue cells.They branch into smaller arteries called arterioles. The arterioles branch into smaller vessels called capillaries. The capillaries allow the movement of materials and gases to tissue cells. Capillaries: Capillaries are thin-walled vessels, they are one cell thick. materials either pass through or between the cells as they leave or enter the blood. Oxygen diffuses through the endothelial cells into the surrounding tissue fluid and cells. Water and small water molecules, such as glucose, diffuse through the gaps inbetween the endothelial cells. Most of the protein stays in the blood vessels. White blood cells can also pass inbetween the endothelial cells. Veins: Blood moves from the capillaries into the venules then to the veins. Veins are thin-walled but are thicker than capillaries. Veins transport blood back to the heart. The blood in the veins is under less pressure than the blood into the arteries because the blood has travelled a further distance from the heart. Veins unlike arteries have valves that prevent the blood from flowing backwards. Contractions of the muscles around the veins help to move the blood along. The lungs provide the red blood cells with oxygen aswell as remove excess oxygen. Once the oxygen has passed through the larynx and trachea it then enters the lungs transfering the gas to the bronchi, then bronchioles, then the alveolar sac. 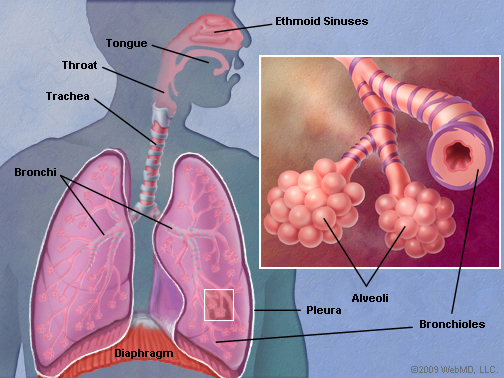 There is a capillary network all over each alveoli on the alveolar sac which transfer oxygen into the blood. The excess carbon dioxide then leaves back up through alveolar sac, bronchi, up the lungs and out the mouth and naval cavity.